Reserve your seats for May 18th! Vote for JDR In the HGTV Ultimate Outdoor Awards! 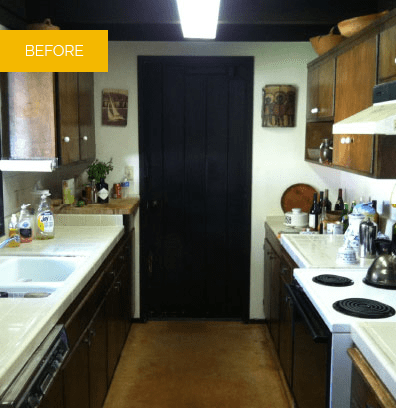 This kitchen remodel is in a La Jolla Farms home designed in the 1960s by noted architect Dale Naegle. The clients, a young couple with school age children, were looking for a historical home and were excited to be only the second owners of this expansive and distinct house. The home needed significant updating to accommodate a young, growing family. 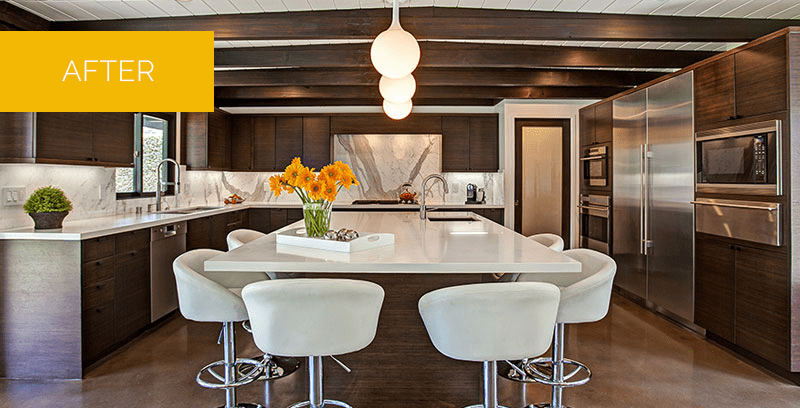 In honor of their passion for the home’s mid-century modern origins, the clients wanted a kitchen influenced by that time period with a contemporary attitude and modern conveniences. The kitchen is now double the size of the original after borrowing space from a bedroom. The design was created with a disciplined linear approach, accommodating large new appliances in a streamlined layout with a minimum of visual clutter. A stunning backsplash of Italian Calacatta marble wraps the kitchen in luxury. Sweeping expanses of white quartz countertops against dark bamboo cabinetry in a horizontal grain present a clean, polished impression and dramatically increase the kitchen’s storage and functionality. The clients now live happily with their new kitchen in a design that respects their home’s original character with stunning contemporary flair while providing a functional hub for their young family. Let us help you with your remodel or new build! We invite you to see the Showroom and Selection Center on our Design Campus! Visit us for a behind-the-scenes look at what makes our projects truly spectacular. Our beautiful and functional vignettes of kitchens and bathrooms, plus a working design studio, offer inspiration, education and personal insight into our people and process. with your remodel or new build! A Team Member will call you within 24 hours.